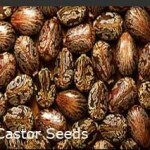 Castor seeds are being sold at the rate of Rs. 4000/quintal in Andhra Pradesh and Telangana owing to steady export demand and increased acreage in the kharif season. Earlier, during the sowing season, prices surged from Rs. 3900/quintal to Rs. 4200/quintal due to slow progress of sowing in Gujarat and Andhra Pradesh. Scientists from Nigeria performed an experiment to analyse the effect of period of fermentation on the nutrients of castor oil seeds. Castor oil seed was dehulled, boiled an d wrapped in a banana leaf. The wrapped seed was kept in a basket and allowed to ferment for four days. The package was unwrapped daily to remove 250g of fermenting cotyledon and dried at 60°C to terminate the fermentation process. 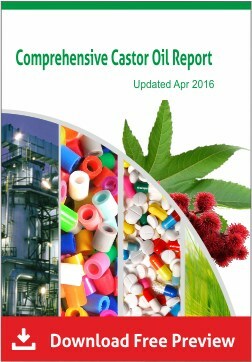 Results showed that the fermented castor oil seeds exhibited increase in moisture, crude protein, crude fibre, carbohydrate, potassium and zinc. The lysine content also significantly increased on the fourth day. 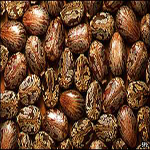 Castor seed prices increased due to good export demand and tight supply from producing belt. 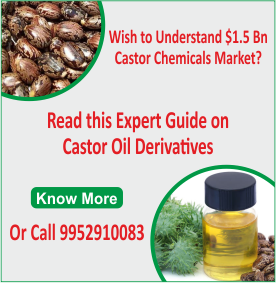 On the Rajkot Commodity Exchange (RCX) castor September futures was up Rs 11 to Rs 4,146 a quintal. About 38,000-40,000 bags arrived in Gujarat and prices gained Rs 5 to Rs 795-805 per 20 kg. Around 1,000-1,100 bags arrived in Saurashtra and went for Rs 765-775. 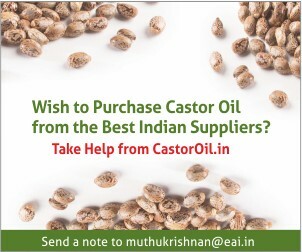 Castor oil was at Rs 815/10 kg. Scientists performed an experiment to analyze the effect of catalysis pyrolysis of castor seed on the yield of oil. Catalytic pyrolysis was carried out at 400°C for different ratios of catalyst to biomass using zeolite as catalyst. 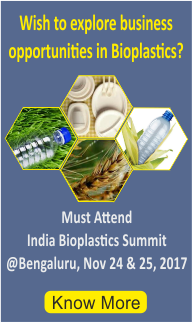 Results showed that compared to thermal pyrolysis of castor seed, catalytic pyrolysis decreased the yield of oil and that the bio oil contained compounds with carbon chain length in the range of C4-C24 that is similar to most of the fuels used.